Complete Silence. Total Silence. Absolute Silence. True Silence. Dead Silence. Silence Kills. Silence = Death. The Silence Button. A Dream Silence. A Vow Of Silence. An Awkward Silence. Enjoy The Silence. The Silent Treatment. Silent Protest. Silent Retreat. Silent Disco. A Silent Vigil. Silent Night. Disruptions to silence such as a dog barking or a fly buzzing were recurrent motifs in early work by Agnes Calf, whose practice is innately bound to the question of what silence actually is, providing a setting for both an exploration of an artwork’s apparent mutism in the face of perception, archivism and interpretation, and an interplay of forms and fragments from the auditory fault lines that seem to characterise our relationship to sound or its absence. Are the world’s reserves of silence being terminally depleted? Is civilization a conspiracy of noise pollution eroding criticality, attentiveness and depth of feeling? Whether imposed or volunteered, is silence merely the absence of something else, and does it really speak louder than words? Whilst Derrida castigated ‘the violence of primitive and prelogical silence’, denouncing silence as a nihilistic enemy of thought, Heidegger and Wittgenstein lamented the loss of our relationship to silence, expressing doubts over the ability of language to fully describe experience. This philosophical schism unhelpfully suggests artists are either for or against a formal or verbal reticence, rather than offering the possibility of a richer analysis of silence’s tactical or theoretical possibilities. Is silence a demand, a wish, a rebuke, a form of resistance or surrender? Does silence even exist? Silence is so accurate presents a new body of gold-tinted work exploring Calf’s take on our desire for idealized states of being, the servitude of quiet coaches, the introversion of pebbles, earplug columns holding up the detached entablature of sleep, the waves and tides within a somnolent touchscreen interrogating fingerprint, the indentations of elbows in repose inviting us to imagine around the gesture and its possible contexts, at a desk, by a window, in a bed, simultaneously the supportive structure of pivoting bones and joints, and that which this support gives flight to, a daydream, contemplation, gradations of sentience. Silence is golden. Silence is so accurate. Installation views, ‘Seminal Bricolage (First Attempt)’, 2016. Installation views, ‘Good things to come’, 2016. Rotation (Pebbles Pizza) (2015). Earth drying clay, pebbles, aerosol paint, acrylic paint on MDF. Kneeling (2015). Earth drying clay, aerosol paint, plinth. Bag Tags (2015). Mixed media. Pebbles/Pizza (2013). 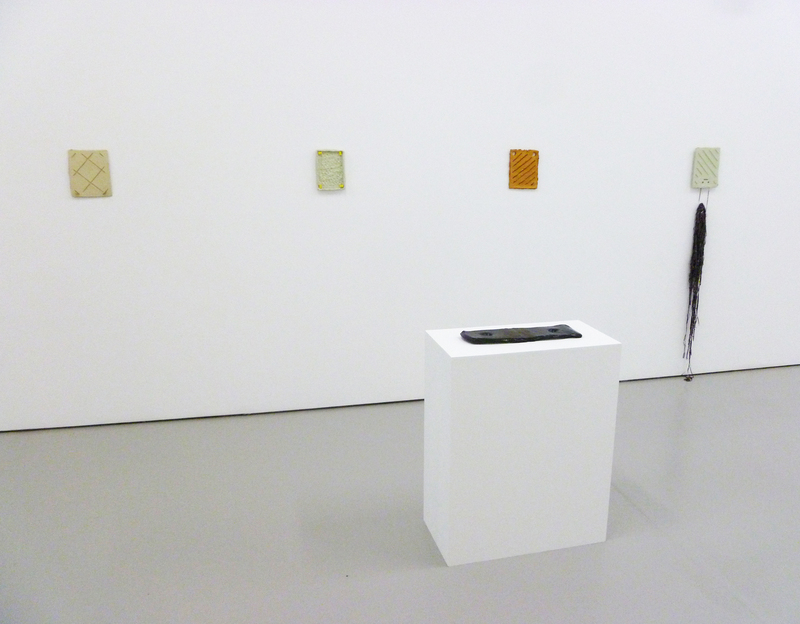 Installation view at ‘Small bird’s nest with blue eggs inside’, MMX Gallery, March 2015. 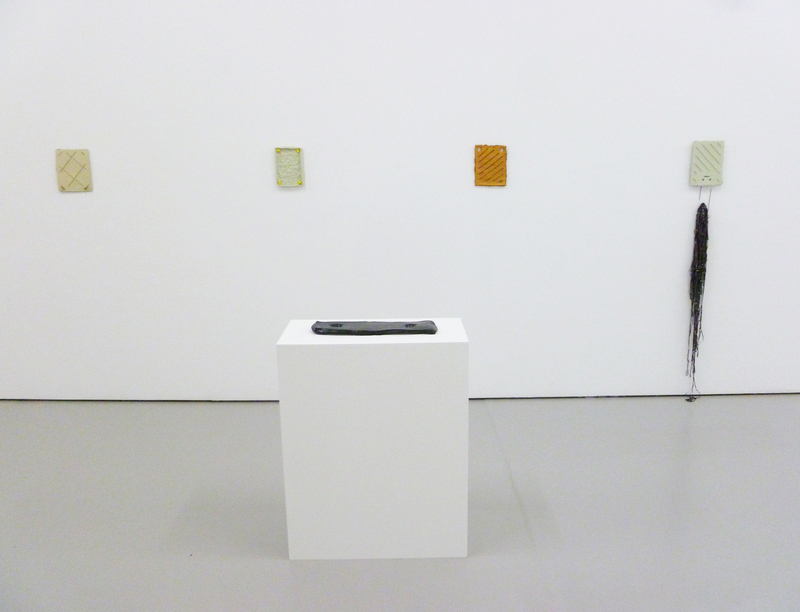 White Sock and Quadruple Rotation (Earplugs), installation view / right, ‘POINTS OF CONTACT’, 2014.